Apply 1 tablespoon of raw honey on your skin for 10-15 minutes on your face & wash it off with normal, lukewarm water. Before this apply 2 tablespoon of milk with 1 tablespoon of rose water in it on your face & neck for 15 minutes. Mix 4-5 fresh rose petals in raw milk, mash them into the milk & make a fine paste of it. Add 1 teaspoon of raw honey in it & apply on your face daily morning for 20-30 minutes, wash with lukewarm water. Take 2 tablespoon of (ready made) Sandalwood powder ( or paste of sandalwood), 1 teaspoon of turmeric powder, 2 tablespoon of Bengal gram powder (chana dal) and 2 tablespoon of raw milk. Make a fine paste and apply this paste daily 15 minutes before bathing. You will have healthy glowing skin. Prepare a mixture of lime juice (10 tablespoon), cucumber juice (10 tablespoon), glycerin (10 tablespoon) and rose water (10 tablespoon) .Apply this mixture on face for 15 minutes, wash with lukewarm/normal water. This mixture can be refrigerated for a week. Massage with 1 tablespoon of mustard oil with 1 tablespoon of lemon/orange juice in it. It brings shine & glow on your face. Dry some orange peels. Grind them to make powder (you can use ready made orange peel powder). Take 2 tablespoon of orange peel powder, add 1 tablespoon of multani mitti, 1 teaspoon of turmeric in it, mix them well & make a fine paste by using raw milk. Apply this paste (for 20-25 minutes) on your face for healthy & glowing skin. Wash with normal/lukewarm water. Make paste of (2 tablespoon) Masoor dal (lentil), curd (3 tablespoon), 1 tablespoon of honey, 10-15 drops of glycerin, make a fine paste of these and apply it daily for 20 minutes for improving your skin complexion in 3-4 weeks. Cucumber & turmeric is very beneficial for dark underarms and neck – Take 2 tablespoon of lemon juice, 2 tablespoon cucumber juice and less than ½ teaspoon of turmeric. Mix all these properly, apply on your face daily. Leave this on for 20 minutes, wash with lukewarm water. Apple & cabbage is very beneficial foe healthy skin. Add raw cabbage & cucumber in your salad daily, cabbage & cucumber contains higher amount of vitamin C, you can boil cabbage to eat. Drink apple, carrots, cabbage, and beetroot juice daily for soft & glowing skin. Add beetroot, mint leaves, carrots, tomato & cucumber in your veg salad regularly. Drinking carrot juice with 5 tablespoon of lemon juice ( add 10-12 mint leaves or tulsi leaves while blending carrots) every morning makes skin healthy & glowing. Keep 2 tablespoon of chirongi (charoli) & 1-2 almonds in raw (unboiled) milk for 5-6 hours. Take out chirongi and make a paste of it and apply on your face. 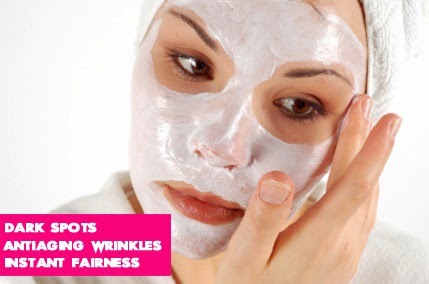 It will make your skin fairer & healthy. Take orange peel powder (2 tablespoon), add egg white, 1 tablespoon of honey & 1 tablespoon of orange/lemon juice in it, mix them well & apply on your face & neck for 20-25 minutes 2-3 times in a week. A face mask made from egg white and honey smoothly removes the tan from your face & brings glow on your skin. Crush a small potato or blend it in grinder & squeeze juice from it, add 1 teaspoon of rose water in it, apply this fresh juice on your neck & face for 15-20 minutes & then wash off with cold water. You will get glowing skin. Mix raw honey (1 teaspoon), lemon/orange juice (half tablespoon) and 1 teaspoon of vegetable oil together. This mixture works as a good moisturizer for dry/normal skin. Apply this mixture for 10-15 minutes daily or once in two days.